Summary: This research seeks to characterize the genetic diversity of green turtles nesting on Florida beaches and foraging in Florida waters. In collaboration with survey and tagging crews, samples representing nesting females have been collected from several Florida beaches during the 2007 nesting season. Utilizing these samples, we will use pairwise tests of mitochondrial haplotype frequency divergence to determine if sufficient structure exists to designate distinct management units among the rookeries comprising the Florida nesting aggregation. In collaboration with the UCF, the Inwater Research Group, and Quantum Resources/FPL, we will also examine the genetic structure of multiple green turtle foraging aggregations along Florida's Atlantic coast as well as the waters of Key West National Wildlife Refuge. This study will attempt to evaluate rookery contributions to each of the foraging grounds based on mitochondrial and microsatellite analyses. 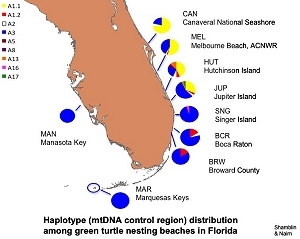 We will also screen for additional informative variation in the mitochondrial genomes of nesting green turtles representing key rookeries in the wider Caribbean with ultimate goal of developing haplotype-specific single nucleotide polymorphism (SNP) assays to improve the resolution of mixed stock analyses.